Suzy, do you know anything about witches? Dario Argento is a respected, hugely popular director and Suspiria is one of the primary reasons why. 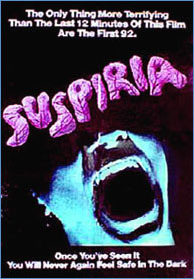 Known in Italy for a string of successful giallo thrillers, Suspiria was his first foray into the supernatural. It is his masterpiece. The garish primary colors, creative camera work and a pounding score by the group Goblin create a truly nightmarish atmosphere. Suzy Banyon (Jessica Harper), an aspiring ballet dancer from America, decides to study at the prestigious Tanzakademie in Freiburg, Germany. When she arrives, there is an feeling of foreboding at the airport - and as she takes a taxi to the school in a ferocious storm. The first person Suzy sees when she arrives at the Academy is a girl named Pat Hingle (Eva Axen), fleeing the building and running into the surrounding woods. She overhears the girl saying something but can't make out what it is. Suzy doesn't get into the school because the voice on the intercom says she isn't expected. So Suzy decides to spend the night in town. Pat comes back and goes up to the room of another girl. She tells her that she's been expelled and that she is going to leave the school immediately. She also says that she has discovered a secret - but she's reluctant to tell her friend about the details. When she is left alone, a figure outside the window attacks Pat and stabs her repeatedly. The killer then ties a rope around her body before dropping her through the glass ceiling of the floor below. The shattered glass kills her friend as well. The next day, Suzy returns to the school and is introduced to the faculty and the other students. They're being questioned by the police investigating the two murders. The instructors are led by Madame Blanc (Joan Bennett) and Miss Tanner (Alida Valli). The Directress of the dance school is supposedly away. Suzy also meets the pianist named Daniel (Flavio Bucci), who happens to be blind...and befriends Sara (Stefania Casini), one of the nicer students. On the first day of class, Suzy is walking towards the practice hall. She sees one of the cooks sitting and holding a shiny object. A glare hits her in the eyes and she is momentarily blinded. When she gets to the class, she is unable to dance or even stand up...and she then faints. A doctors who attends to her tells Suzy that her condition is the result of the school's rigorous dance classes. That evening, she finds maggots in her hair. Suddenly, there are girls running through the halls screaming. There are maggots everywhere. A thorough search of the school by Miss Tanner turns up some rotten food in the attic. The students are relocated to the practice hall for the night. When the lights are turned out, Suzy and Sara hear heavy breathing coming from behind the makeshift sheets that are set up around them. Suzy tells Sara that the noises must be coming from the Directress. Daniel is fired and thrown out of the school when his seeing-eye dog bites Madame Blanc's nephew. As he is leaving the school, the dog suddenly turns on him and rips into his neck and mutilates him. Suzy and Sara begin to suspect something. Every night, they hear the teachers' footsteps going to a part of the school that none of the students have access to. Sara tells Suzy that Pat was her friend and that she has notes that the murdered student was keeping. When those notes disappear, Sara frantically tries to tell Suzy that their lives are in danger. But Suzy is heavily medicated and can't respond. Frightened, Sara tries to leave the academy...but ends up being chased by someone trying to kill her. She falls into a room filled with barbed wire and a hand suddenly reaches out and slits her throat. The next day, Suzy is told that Sara left the school the previous evening on her own. Later, she finds out from the dead girl's psychiatrist that the academy was founded by a centuries-old sorceress named Helena Marcos. One night, Suzy is left alone while the faculty and students have supposedly gone to the theatre. She decides to look for the area of the school she hears footsteps going to every night. Guided by the words she heard spoken by Pat, she finds her way to a secret passageway. She comes upon Madame Blanc and Miss Tanner...and discovers that they are actually witches in the service of Helena Marcos. She sees them preparing to kill her with a spell - and in another, she room finds Marcos. As the zombified corpse of Sara is coming towards her with a knife, Suzy stabs Helena Marcos with a crystal spike. The Directress is killed and Sara's corpse disappears. Suzy runs through the school and makes it outside...as the building bursts into flames and the witches all perish. She walks away as yet another thunderstorm rages - with a look of sheer relief on her face. 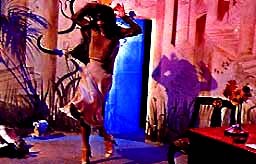 Suspiria remains Dario Argento's best known and probably most beloved work. It was an international success. His previous film, Profondo Rosso (Deep Red), had been a big hit in Italy, but with this film, Argento wanted to advance from the "giallo" format to the magical thriller. During filming, Dario Argento's girlfriend at the time, Daria, told him about her grandmother's experiences at a finishing school where "black magic" was practiced after hours. Ultimately, that finishing school was the inspiration for the dance academy in Suspiria. He says, "It was always meant to be an acid trip. I went to Germany to shoot it to accent all the expressionistic fairytale aspects." He acheived this by filming with an outmoded Technicolor stock. Argento also had cinematographer Luciano Tovoli watch classic Walt Disney cartoons in an effort to create the vivid psychedelic color palette he wanted. As for the much-celebrated opening, the director recalls, "I wanted the strongest impact possible. The whole point was to start Suspiria in the way a normal horror film would usually finish. That kept the audience on edge wondering what could possibly come next." The story was based in part on Thomas De Quincey's Confessions of an Opium Eater, especially the "Three Mothers of Sighs, Darkness and Tears," and the "Snow White" fairytale. It was to be the first of a trilogy about witches spreading evil from different corners of the world. Horror aside, Suspiria is fascinating because of it's recurring symbols and intense style. Repeatedly, water, light and color are used in matching patterns. At the beginning of the film, water is shown in the gutters of the airport, the rain coming down, Suzy sees a dam overflowing on her way to the school. H2O is used constantly to wash things off. But these are done in such a way as to emphasize the element of water. Blues and red are the dominant colors...on people's faces, walls, hallways...sometimes a green comes in, too, but all three are very vivid colors. It creates this atmosphere of un-reality, which is really fascinating. The whole effect is one of extreme style in a dream-like state. Argento's follow-up to this, Inferno (released in 1980), concerned supernatural occurances in New York. It was not received well - but that did not discourage him from filming the third part of the project, released in 2007. La terza madre AKA Mother of Tears was a disappointment to many who had waited years for the final installment.